We really value all our clients and contacts. 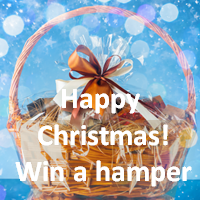 To say thank you for your support and as Christmas is the season for giving, we’d like to enter you into a prize draw to win a little Christmas hamper, with a few treats from companies with a great sustainability track record. Clicking on the link from our 2017 greeting card means your email address will be entered into the draw, and a winner will be chosen at random from all email addresses on 15 December.